One thing I always need for my hardware projects whether I’m working on sensors for the home or a fitness device is a low power, cross platform and affordable wireless module. I’ve used HopeRF modules like the RMF22B for their affordability and low power capabilities, but because they don’t use any standard wireless protocol I’m forced to make adapters for endpoints like smart phones or computers. Wireless standards like ZigBee partially solve this problem, but off the shelf modules are expensive and still don’t help if you want to talk to a smart phone. One might think Bluetooth is the solution then, but in the past power efficiency and range were a problem if you were building a temperature sensor for example. Also, you had to be a certified Apple accessory developer if you wanted to make a Bluetooth accessory for the most popular smart phone in the market. Well, all of this has changed with Bluetooth 4. There are two reasons why you should be excited by this. First, this low energy mode means you can use Bluetooth in a range of new applications like home automation, wearable electronics or anything that needs to log data for long periods of time. Second, Apple has opened up their Bluetooth API so anyone can create a Bluetooth accessory for iOS 5 and later. Why did they do this? One reason might be they don’t have to worry about developers draining a users battery with a poorly made accessory with the new standard. I can’t think of any reason to use a different wireless standard for these reasons. This brings me to my breakout board. This breakout board is the reference schematic for the Nordic nRF8001 done in Eagle originally done in Altium by Nordic. 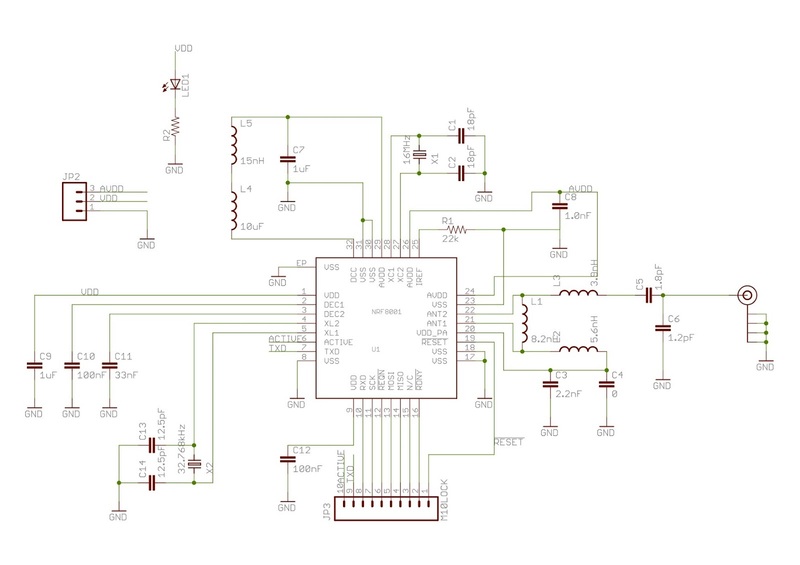 It is a simple wireless transceiver with an SPI interface with few passive components. Why this IC? A quick search on the major electronic distributor websites shows there are a few manufacturers of Bluetooth 4 chips. Parts from Panasonic, Blue Giga and RFM provide ready to go modules, which explain their high price. RFM actually includes WiFi! Only TI, CSR and Nordic provide ICs. However, TI is a bit larger and expensive because it provides a complete system-on-a-chip with integrated 8051 processor while CSR makes you sign a NDA to get the datasheet. So I choose Nordic because of the ICs small footprint, open specs, affordability and simplicity. Sourcing the parts from Mouser.com it looks like a populated board should cost ~$12. Take a look at my BOM. One thing you should keep in mind is none of these chips are backward compatible with older Bluetooth standards, but that should not be a problem by the end of 2012. I plan to send out the board and order the parts this week. Hopefully I can also start working on firmware and a few demo smartphone apps. Until then checkout the source on Github. Credit to Dr. Michael Kroll for the information about Bluetooth 4 and Mi-Fi. Check out his Arduino Shield.